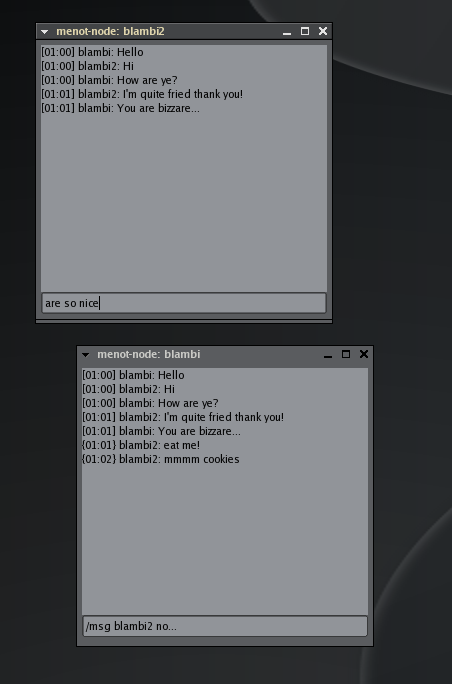 menot is a program for sending messages between host's, like an RPC and Chat. The big difference here is that it is done anonymously and encrypted. A stupid server that only send and receive the data. A node that don't send any data, but displays it trough the use of xosd. Well guess what, it is a lib for speeding up the creation of node's. Listens in the public after the command to return it's host's uptime. Queries for node-updemon's uptime and creates a xhtml 1.1 page based on the output. License: GPL v2 or newer.